I have just come back from a week at Kew where I have immersed myself in the historical collections at The National Archives (TNA). I was one of fifteen (MA and PhD students) fortunate enough to be accepted on the fully-funded AHRC ‘Archival Research Skills for Historians: Modern British Programme’ which the Institute of Historical Research advertised. And what an eye-opener it was! We had lectures and some very challenging group exercises which culminated in a group presentation on the last day. The warm up ‘speed dating documents’ game we did on our first morning provided a quick overview of the different types of documents at TNA. I found many collections are relevant not just to the history of education, but also to the sociology, politics and philosophy of education as they undoubtedly extend our understanding of the period of study. During the course of the week I also found out about the best ways to search the various series/collections using ‘Discovery’, the TNA’s cataloguing system. This is a crucial requirement to make the most of TNA as not all the materials are catalogued to item level (a box may be listed but not the contents, for instance) and the detail of the catalogue records vary – some are incredibly detailed whilst others will have very short entries. Further, since less than 5% of the collection is digitised, you do need to have this know how to unearth the treasures in this unique national resource. The ‘Research Guides’ are essential and provide a good starting point as they refer users to ‘Registers’ (subject and numerical indexes) compiled by clerks working in the various government departments. I hope the information below will highlight the key collections for educationalists. Briony Paxman and Ann Morton (author of the very useful Education and the State from 1833(published 1997) were on hand to introduce us to the History of Education (ED) series. This series includes the schools inspectorate reports (the Returns of 1871 which we looked at in our groups were particularly interesting as they list the different types of schools that existed including ‘Adventure Schools’ which were unregulated, and in the example we looked at, the enterprise was set up by an individual who ate, slept and ran the school from a single room!). This collection also includes records on elementary, primary, secondary schools and special services in education, papers on the subject of teacher training, teachers and pupils, and on technical and further education colleges. This is a key resource for historians of education. 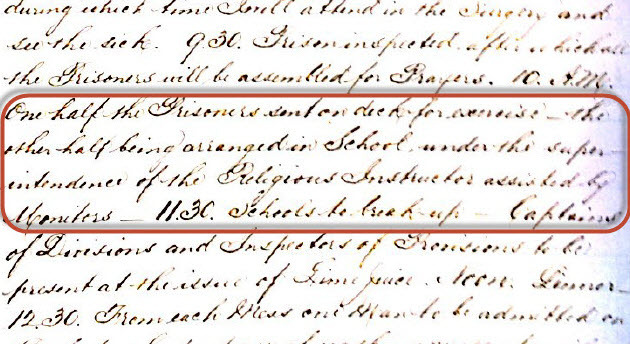 The above excerpt which reads,”10 a.m. One half of the Prisoners sent on deck for exercise – The other half being arranged in School under the superintendence of the Religious Instructor assisted by Monitors” provides a glimpse of the religious instruction onboard convict ships. There are many sources relevant to education in the Treasury series (T) which is useful because virtually every area of government action involved the Treasury at some stage and of course, education was partially funded by the state from the early part of the 19th century. The Ministry of Health (MH) records deal with, among other related subjects, health and social policy (1919-1939) and public health and epidemics in the 19th century. The latter is particularly interesting as you can glean information on school closures affected by epidemics (small pox, measles, typhoid etc.) and how the government of the day concerned itself with the health of the nation and in particular the health of children. Documents on housing, sanitation, water supply, the building of water closets and closure of cesspits, compulsory vaccination etc are contained in this series and provide a useful focus for those studying the impact of public health on education. Of interest too is the subject of education for the underprivileged in Victorian society and of note is the correspondence between the Poor Law Commission, the Board of Guardians and the Poor Law Unions which provides an insight into the education afforded to workhouse inmates (MH 12). There are many more relevant series such as for instance the Colonial Office (CO – which includes the Commonwealth and Foreign and Commonwealth Offices), the British Council (BW), the Foreign Office (FO) and the Admiralty (ADM) series. The records of the Admiralty, Naval Forces, Royal Marines, Coastguard and related bodies are particularly interesting in the study of the education of the armed forces and their families. The TNA website at http://www.nationalarchives.gov.uk/also links to the local archives union catalogue, A2A: Access to Archives and ARCHON which includes contact details of record repositories in the UK and other substantial archive collections elsewhere in the world. It is worth noting that many of the local archives will have the county records and the documents contained in these repositories are likely to help fill a gap as the TNA does not purport to have a full set of materials for all subject areas. Over the years material has been weeded by the various government departments and therefore these additional repositories should also be consulted. Though it was frustrating not having personal research time embedded in the programme (and I could see that there was a lot to cover in the long days which began at 09:00 and often finished at 19:00), I did manage to get some of my own research done. All in all, I found the course immensely useful and challenging. I am grateful to both the funders (AHRC) and to the tutors on the course, Sarah Hutton, Briony Paxman (who is the education archivist) and Dr. Paul Carter, for making the learning so enjoyable. I can truly say I am hooked on TNA! This entry was posted in Research Support, Special Collections and tagged Admiralty, Board of Education, Home Office, Ministry of Health, Poor Law, Poor Law Commission, Poor Law Unions, The National Archives, TNA, Treasury. Bookmark the permalink. Sounds fascinating – I went to a forces school abroad that no longer exists … wonder if their records would be there?